Saks OFF 5th FIFTH CITY. Department stores, retail, multinational chain of personal care and beauty stores are using their own brands to stand out from the competition — and it works! For example, Belk, Sephora, Ulta, Target are just some that have successfully launched private labels that consumers love. In the past, when people hear private labels, the term “generic” comes to mind. Now, private labels can be a powerful and successful brand differentiator — especially for loyal customers like me. With digital age, price comparisons are just a click away. If a particular store has excellent customer service and loyal shoppers, then launching a private brand strategy can increase growth. 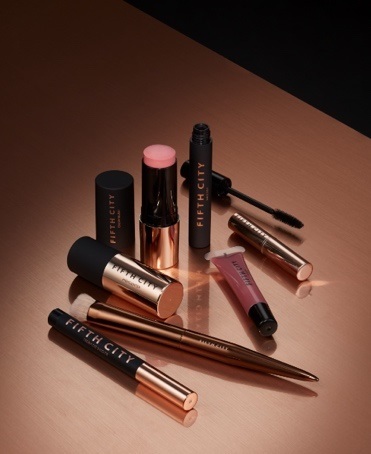 Most recently, one of my favorite department stores, Saks OFF 5TH, launched a new makeup line called FIFTH CITY. When I heard about its new private beauty line, I was ecstatic, because I love Saks OFF 5TH’s amazing deals on more than 800 designer brands for adults and kids. Its new exclusive beauty collection consists of the envy-worth, top quality and luxury makeup products and beauty tools at amazing prices that range from $4.99 to $60! There are more than 35 products in its latest beauty launch: brushes with a modern, ultra-dense design and premium, cruelty-free bristles, such as the deluxe powder brush, 360° foundation brush, conceal and line brush, face, eye and lip makeup products and even accessories, such as ribbon hair ties and a towel turban. Spring is here and summer is near. Whether you’re looking to try something new, you’re traveling for spring break, or you’re looking for something special for Mother’s Day — be sure to try FIFTH CITY. For more information, visit here.